Most computer users know that the system can be infected by Internet threats such as virus, spyware, malware, rootkit, Trojan, bots, adware and etc. But not many may know that another very serious threat is keylogger, which planted into system unknowingly without user knowledge or via backdoor to secretly and silently record and capture keystrokes, screen and traffic activities in order to retrieve sensitive private information such as PIN, password and credit card CVV numbers. Some anti-virus product or security suite can detect and clean most types of key loggers, but they’re not the expert or specialist tool to remove keylogger, and has high potential of false negative. Other such as KeyScambler focuses on anti-logging intrusion. 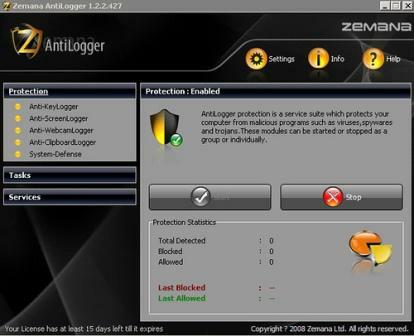 Zemana AntiLogger improves on existing security by providing advanced behavioral protection against the very latest spyware, rootkits, Trojans, viruses, bots, spybot, adware and password stealers and other harmful malware including prevention against data theft by a multitude of logging techniques. An email with a valid genuine product key serial for Zeman AntiLogger will be sent to your inbox. Download and install Zemana AntiLogger from zemana.com (direct download link for Zemana AntiLogger version 1.2.2.427: AntiLogger_1.2.2.427.exe). Activate the Zeman AntiLogger from trial version to full version by entering the serial number at Service -> License -> Enter License text box, and then click on “Renew License”.